Dr. D.K. 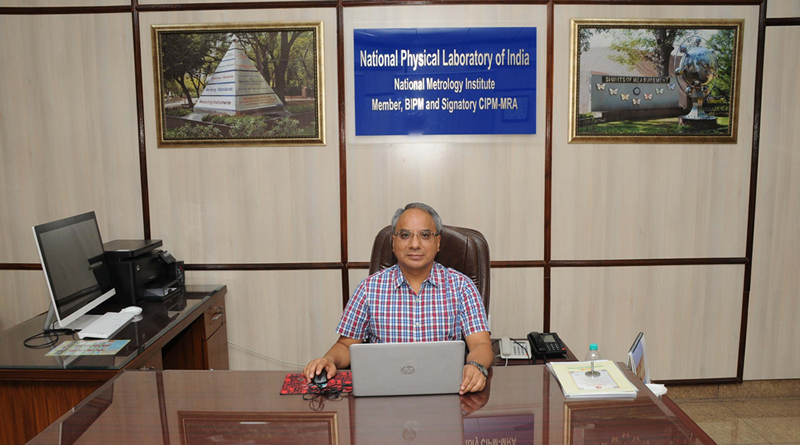 Aswal has taken over the charge of Director, CSIR- National Physical Laboratory (CSIR-NPL), New Delhi with effect from 15th December 2015 maintaining lien with his position as “Outstanding Scientist” at Bhabha Atomic Research Centre (BARC), Department of Atomic Energy (DAE), Government of India, Mumbai. Dr. Aswal, during 2012-2015, has also served as Secretary, Atomic Energy Education Society (AEES), Mumbai, which is an autonomous institution under DAE. Dr. Aswal joined BARC through the training school batch of the year 1986 (i.e. 30th batch) after completing M.Sc. in Physics (Gold medalist) from Garhwal University in 1985. He obtained Ph.D. in Physics from Mumbai University and subsequently carried out post-doctoral research work at Research Institute of Electronics, Hamamatsu, Japan. He is a condensed matter physicist of international repute and has made several outstanding contributions in the areas of molecular electronics, physics of organic films and their applications, thermoelectric power generators and gas sensors. He has edited three books, contributed 20 book chapters, published over 250 peer reviewed journal papers, filed three patents and secured the trademark of Bhartiya Nirdeshak Dravys (BND) – the Indian Certified Reference Materials. His current focus is to enhance the Metrological capabilities of India at par with international standards for continuous improvement of the quality and safety of life in the country and making CSIR-NPL as a growth engine of the nation by supporting industries and strategic sectors through apex calibration facilities. As a member of “International Bureau of Weights and Measure (BIPM)”, France, “Asia Pacific Metrology Program, APMP”, and “International Union of Pure and Applied Physics, IUPAP”, he ensures that the country’s interests at international level are fulfilled. He is a crusader of strengthening the “Quality-infrastructure (metrology, accreditation and standards)” of India for its quick transformation from a developing-state to a developed-state. As a President of Metrological Society of India (MSI), New Delhi, and Chairman/ member of various national committees, Dr Aswal ensures that the national policies, academia, strategic sectors and industries are benefited from the quality-infrastructure of the country. Setting up of the primary and back-up atomic clocks for generation of Indian Standard Time (IST) with an accuracy of few nano-second traceable to BIPM and to ensure its nation-wide dissemination for the social, scientific, economic and strategic growth of the country. This work is being implemented in collaboration with Legal Metrology, Ministry of Consumer Affairs, Indian Space Research Organization (ISRO) and Department of Telecommunication, Government of India. Establishing the new SI units based on the fundamental constants. Establishing the Type Testing, Calibration and Certification Facility for “Online Continuous Emissions Monitoring System” (OCEMS) & “Continuous Ambient Air Quality Monitoring System” (CAAQMS) environmental pollutants in association with Ministry of Environment, Government of India. Establishing the “Primary Standard for the measurement of efficiency of solar cells” in collaboration with Ministry of New and Renewable Energy (MNRE), Government of India. Indigenous production of Certified Reference Materials (trademarked as Bharatiya Nirdeshak Dravya-BNDTM) in collaboration with Ministry of Commerce, Government of India, through various reference material producers in the field of water, cement, metals, alloys, petroleum products, coal, food etc. This will ensure enhancing the quality of products and processes in the country. Establishing a “National Centre for Ballistic Materials Testing” at CSIR-NPL in association with NITI Aayog to support national program on the indigenous development of “Body Armors”. Setting up of apex level calibration facilities for biomedical instruments and their dissemination to hospitals, clinical labs, biomedical industries and institutes. Training of academia, industry and regulator personnel in the area of measurement standards and traceability. A new one-year course on “Precession Measurement and Quality Control (PMQC)” has been initiated at NPL.